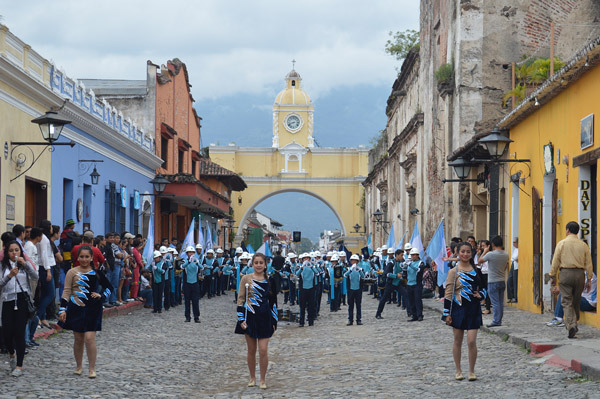 Independence Day celebrations in Guatemala include flags flying everywhere, speeches, music, celebratory food, and fireworks, but most especially in La Antigua Guatemala generations of students from local schools have marched through the cobblestone streets for almost a century. 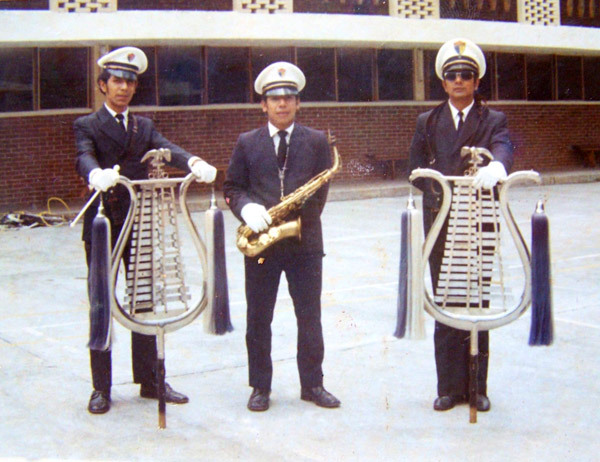 Banda instrumental Colegio La Salle, around 1964. 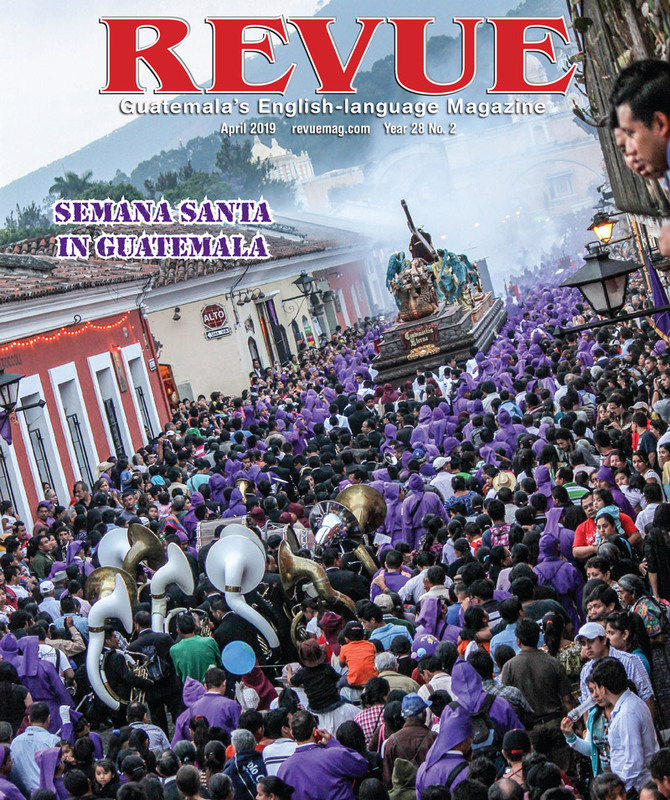 Photo courtesy of Luis Navas Rivera. 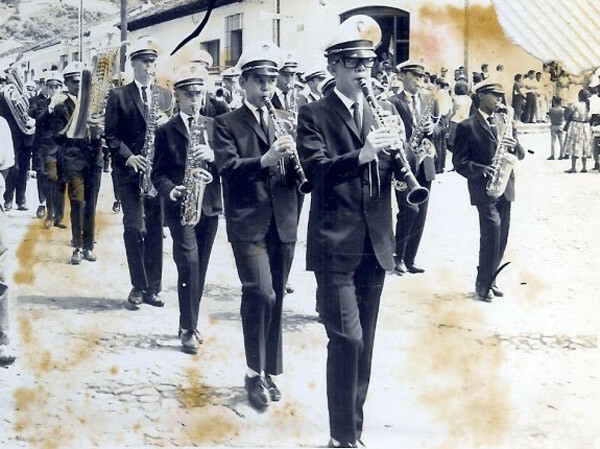 Banda Colegio La Salle, around 1964. Photo courtesy of Luis Navas Rivera. 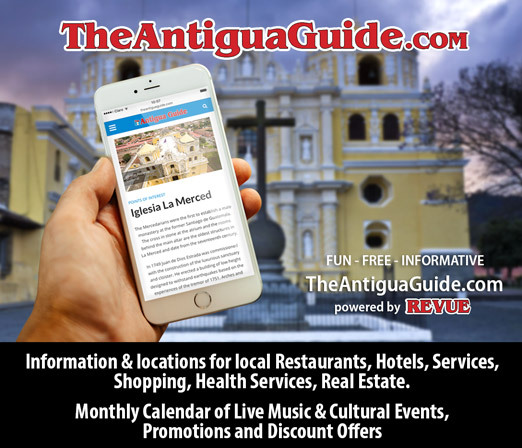 Through the years the high mark has been set by enduring bands from four educational institutions, Antonio Larrazabal (INVAL), Olimpia Leal (INSOL), Colegio La Salle and the Liceo Antigüeño. 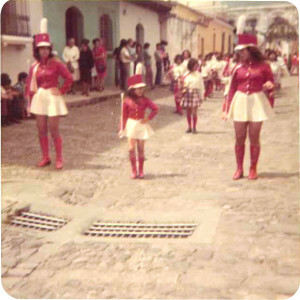 Marchers Colegio La Salle, around 1968. The two instruments on the sides are called “The Eagles” they are the flagship instruments of this band and are used to this date. Photo courtesy of Luis Navas Rivera. 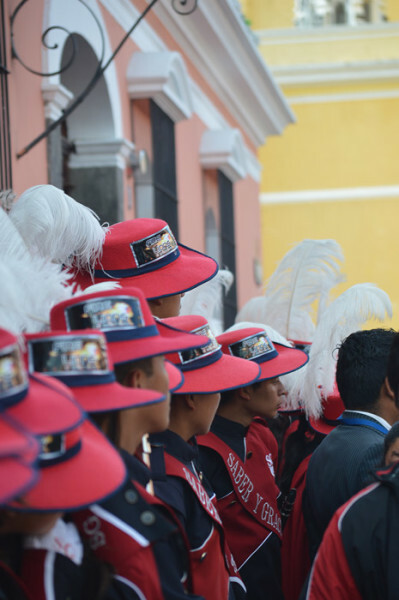 Other stand-out marching bands include Liceo Rosales whose members wearing dashing red uniforms and the Colegio Santa Familia’s fabulous flag squad. 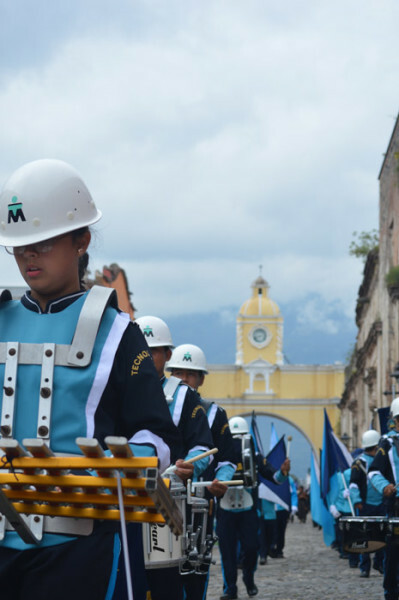 Also, a shout out to a new generation of marchers from schools including the Colegio Tridentino, known as the “White Squad,” and the Tecnológico Moderno Centro Educativo,” who have integrated protective helmets as part of their uniforms. 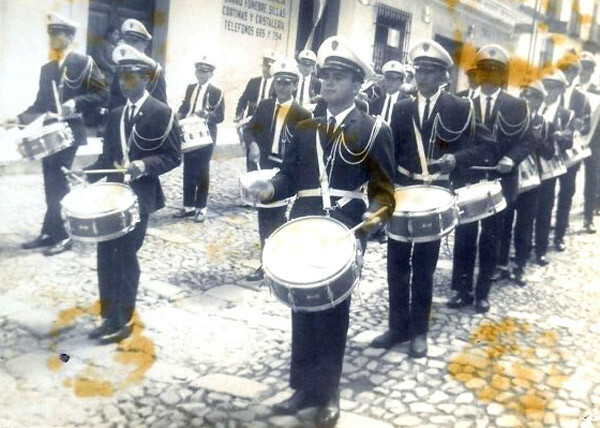 The marching music has changed through the years as well. 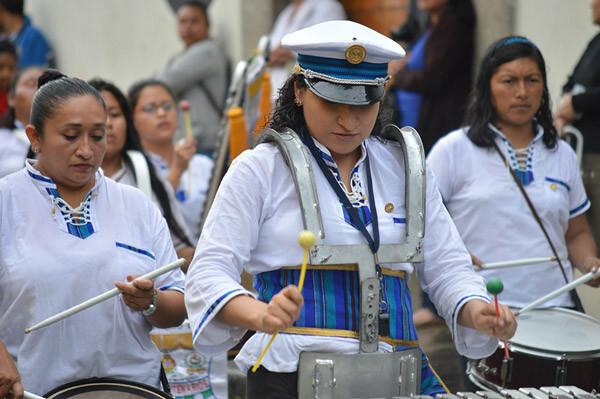 The military beat has evolved into a new style known as the Latin Band, many now march to the rhythmic sounds of cumbias, ballenato, samba and other Latin American melodies. Colegio Tecnológico Moderno Centro Educativo. Photos by Ludwing Paniagua. 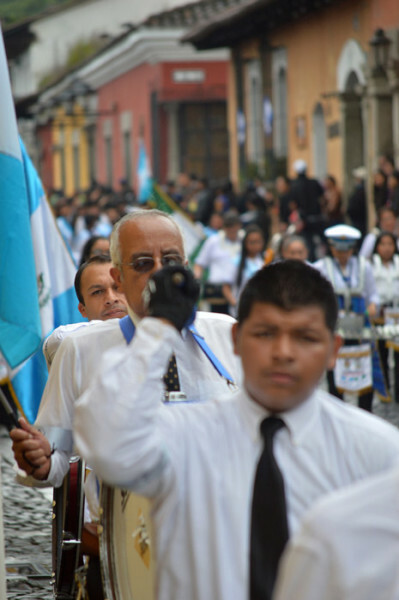 This change has its origins in what we refer to as “the four years of silence.” After the Peace Accords were signed in Guatemala in 1996, President Alvaro Arzú decreed that standard military-style marches would be prohibited from Independence Day celebrations. 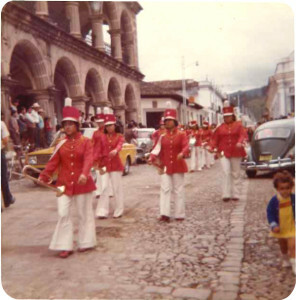 In 2000, newly elected President Alfonso Portillo declared, to the delight of many, that parades were allowed again. 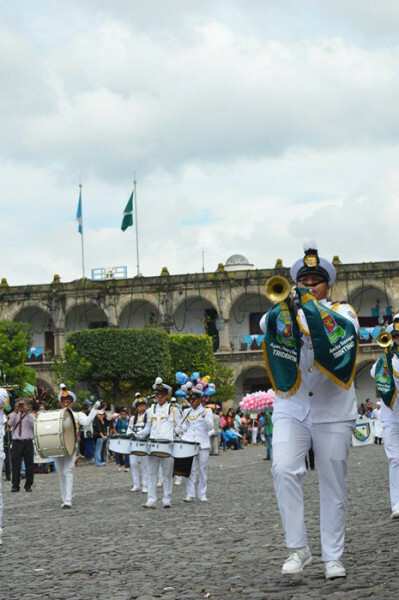 Schools like Colegio La Salle called upon its former students to train a new generation of marchers. For almost six months, 23-year old’s and up “went back to school” — dusting off the old instruments and started training kids from scratch. 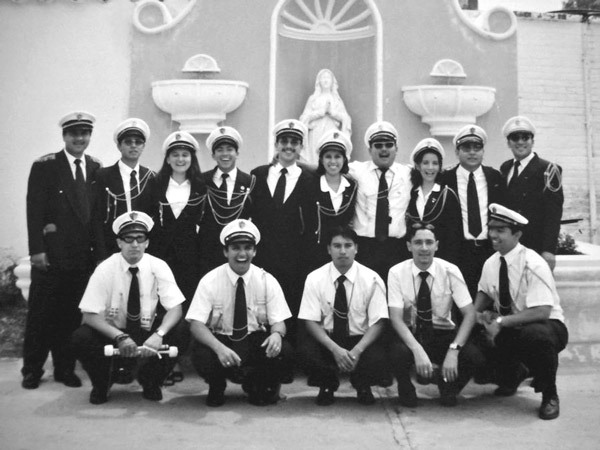 Former students from Colegio La Salle posing after playing for the first time since they left school, this team accompanied the new generation of interpreters in their first parade, after “the four years of silence”. 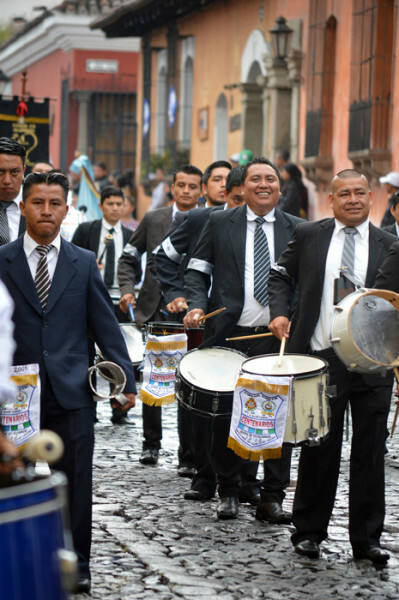 By now Guatemalans were not interested in hearing the same old military drum beats; instead it was all about the Latin Band with popular songs like “Ojos Asi” by Shakira adapted to a marching format ~ it was an immediate hit with the crowds. 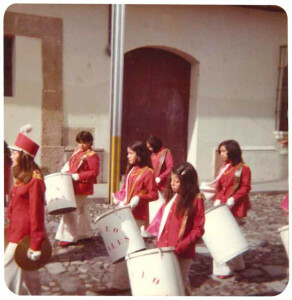 With the former students training the new school bands, and all the nostalgia that it represented, the longing to play and march once again, a new movement was born, the “Bandas de Exalumnos” (former student’s bands). 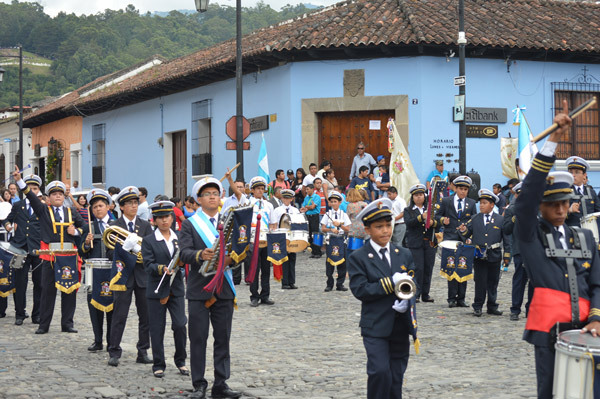 The first school featuring a Banda de Exalumnos was INVAL, the 100-year-old all-male state educational institute. 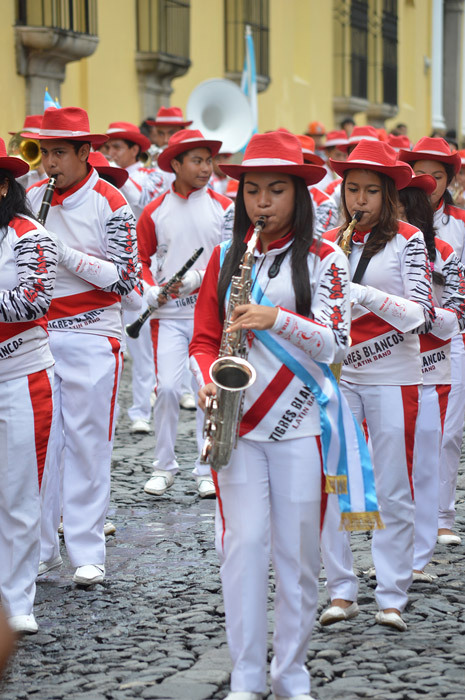 This year four adult bands, Banda de Exalumnos del INVAL, Banda de Exalumnos del INSOL, Banda de Exalumnos Lasallistas, and Banda de Exalumnos del Liceo Antigüeño will be playing, along with other student bands during the Independence Day parade. 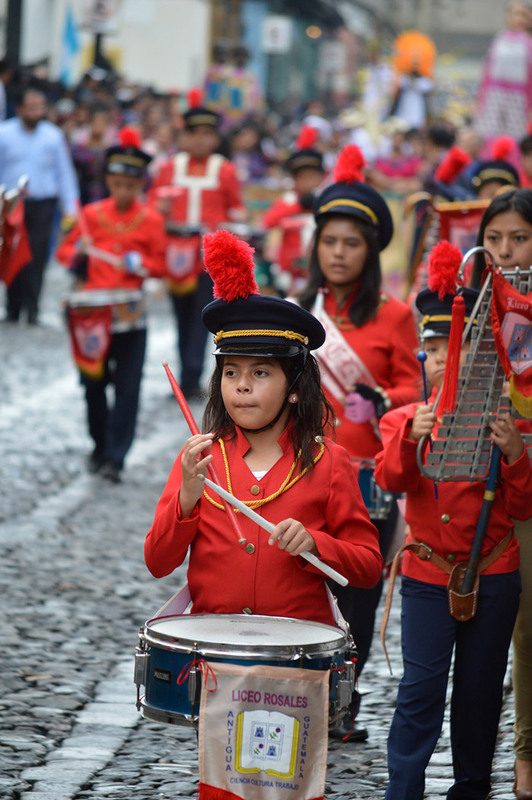 Come rain or shine come Sept. 15 you won’t want to miss seeing La Antigua’s spectacular marching bands. 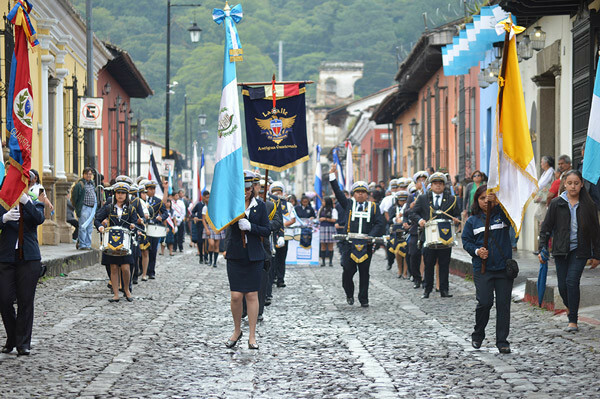 The main procession takes place in the morning starting at the Barrio de la de Concepción, east side of La Antigua, to the Municipal Stadium. 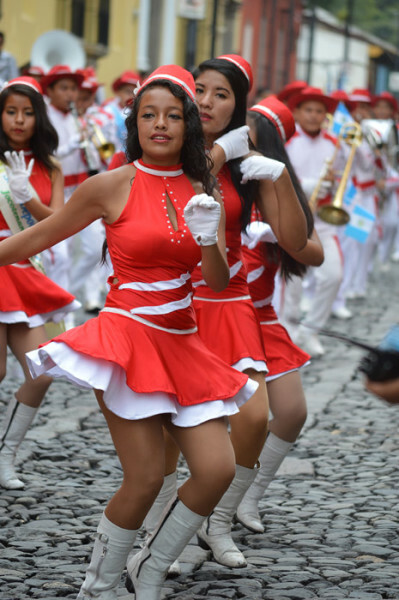 We especially recommend watching the parade as it passes through Central Park or along the Calle del Arco.